Last Sunday, Mrs. Trike and I experienced our first TOT. What’s a TOT? 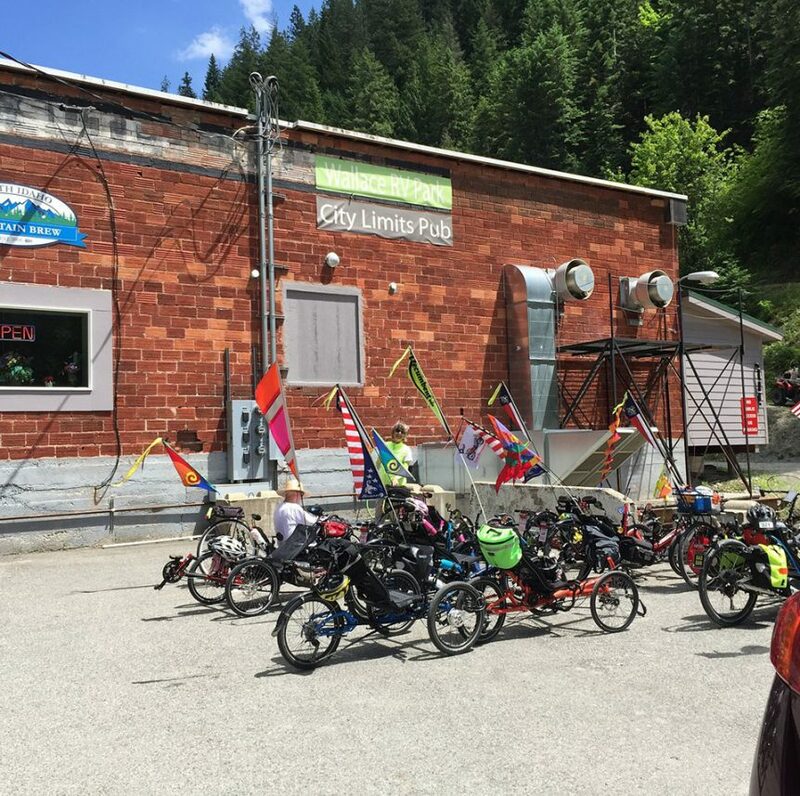 Originally, it stood for “Trikes Only Tour” but since trikers are a relaxed bunch and really not exclusive, it evolved into “Trikes Optional Tour.” Our Sunday ride was called a mini-TOT, since it was relatively short and held on a single day. Full TOT’s tend to be longer with overnight stays. Sunday’s Foothills mini-TOT was organized by John and Doreen Anderson of Enumclaw. John is a triker, gardener, and video-maker extraordinaire and a long-time supporter of the Foothills Trail. This fine paved rail-to-trail route runs from Puyallup to Buckley currently, a distance of about 21 miles. 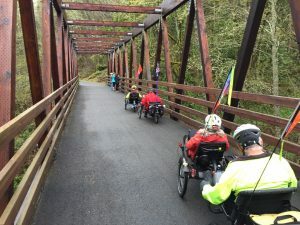 Another segment starts across the river from Buckley and runs to Enumclaw, so when the small gap is closed the trail will be about 30 miles long. 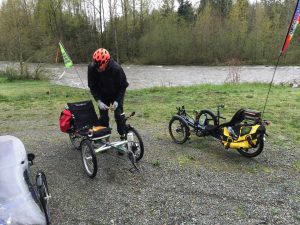 Sunday a dozen trikers and a two bikes rolled out of a trailhead at the tiny town of South Prairie around 10:30 am, just as the rain stopped. We rode in ragged single file to the bank of the White River, just beyond Buckley, and then returned a couple of miles for lunch at Wally’s, a classic 50’s diner. The trail was interesting, with restored bridges, forest, river, and a place where the trail does a switchback and you can look down on a bridge you crossed earlier. John raced back and forth on his Catrike, holding his video camera overhead to capture the ride for his website. The rain held off, with showers before and after. John sure knows how to time the weather! We had great conversations over lunch, and got a preview of June’s annual multi-day TaterTOT in Kellogg, Idaho from some of its regulars. There, after days on Idaho’s rail trails, we plan to eat and drink with trikers from all over the country, make music (part of the tradition) and talk about the day’s moose sightings (really!). Sunday’s TOT confirmed our belief that this is a fun bunch of people to be around. Copyright © 2018 Seattle Trike. All rights reserved.